Spring is finally here- and it’s been long awaited considering the incredibly cold winter that we had in Boston this year! 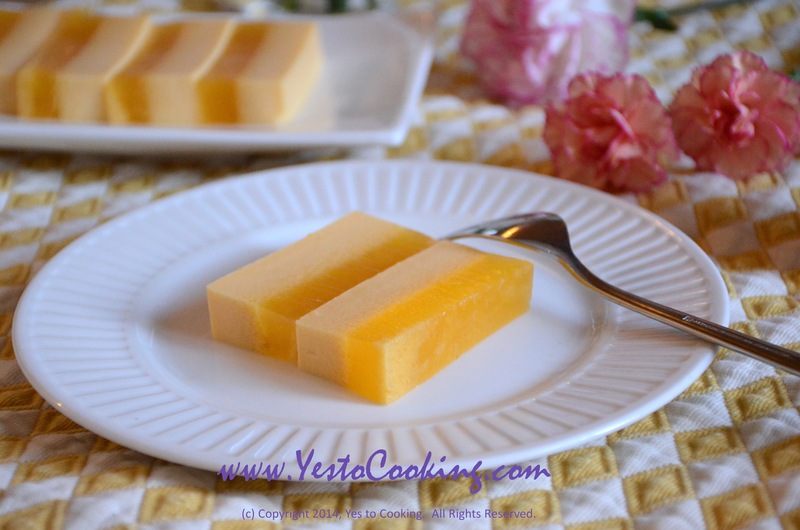 To welcome the beauty of spring, I’m sharing this layered mango jelly dessert that my uncle gifted me. It’s simply amazing how light and fragrant this dessert is, and will keep you wanting more. 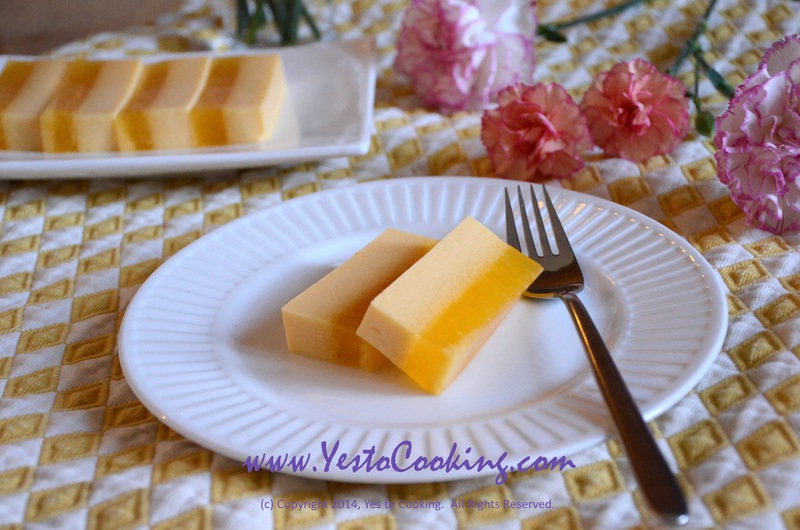 For this recipe, we will be using agar agar which is known as the “vegetarian gelatin”. It is widely available in health food stores and supermarkets. Agar agar is Malay for jelly (thus we say “jelly jelly” when we say agar agar). Since it is derived from a plant source, agar agar is used as a substitute for gelatin in many recipes because it is suitable for vegetarian and vegan diets. There is no taste, no odor, and no color to agar agar; and it is able to set firmly even at room temperature. 1) To make the coconut milk jelly, place all ingredients in a saucepan & cook over low-medium heat until it reaches a boil. Stir occasionally. 2) Remove from heat & pour through a fine strainer into a 8″ inch Pyrex glass container. Set aside to cool. Then cover and refrigerate (at least 1.5 hours). 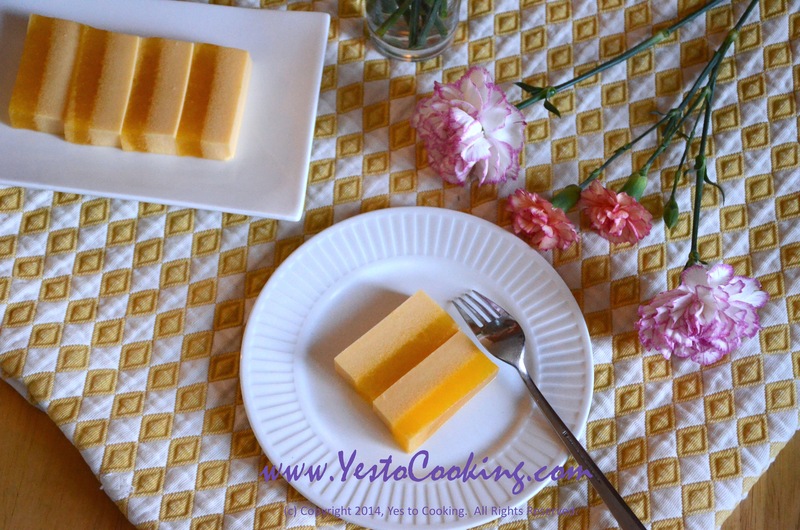 3) To make the top layer mango jelly, place the water, sugar & agar-agar powder into a clean saucepan & cook over low-medium heat until it reaches a boil. Stir occasionally. Remove from heat & set aside to cool down for 5-10 minutes. 4) Next, pour the mango mixture on top of the coconut jelly. Then cover and refrigerate until firmly set and chilled (at least 1 hour). Cut into pieces for serving. Tags: cold desserts, fruit dessert, layered jelly, layered mango jelly, mango jelly dessert, simple desserts. Bookmark the permalink. May I ask did you use mango juice that you bought from the store or did you make your own mango juice? Thanks.